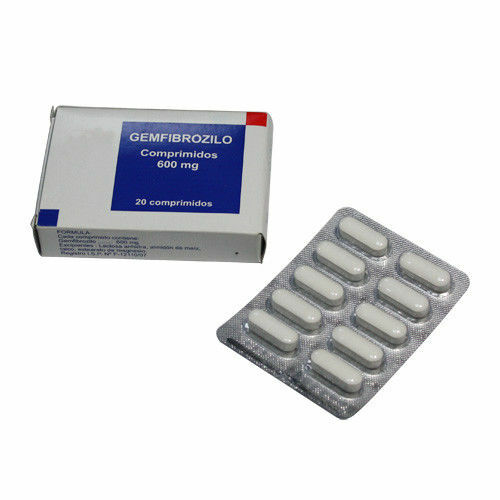 Gemfibrozil is a lipid regulating agent.lt is a white solid which is stable under ordinary conditions. The solubility in water and acid is 0.0019% and in dilute base it is greater than 1%. The melting point is 58°-61°C. Reducing the risk of developing coronary heart disease only in Type IIb patients without history of or symptoms of existing coronary heart disease who have had an inadequate response to weight loss, dietary therapy, exercise, and other pharmacologic agents (such as bile acid sequestrants and nicotinic acid, known to reduce LDL- and raise HDL-cholesterol) and who have the following triad of lipid abnormalities: low HDL-cholesterol levels in addition to elevated LDL-cholesterol and elevated triglycerides. The National Cholesterol Education Program has defined a serum HDL-cholesterol value that is consistently below 35 mg/dL as constituting an independent risk factor for coronary heart disease . Patients with significantly elevated triglycerides should be closely observed when treated with gemfibrozil. In some patients with high triglyceride levels, treatment with gemfibrozil is associated with a significant increase in LDL-cholesterol. Because of potential toxicity such as malignancy, gallbladder disease, abdominal pain leading to appendectomy and other abdominal surgeries, an increased incidence in noncoronary mortality, and the 44% relative increase during the trial period in age-adjusted all-cause mortality seen with the chemically and pharmacologically related drug, clofibrate, the potential benefit of gemfibrozil in treating type iia patients with elevations of ldl-cholesterol only is not likely to outweigh the risks. Gemfibrozil is also not indicated for the treatment of patients with low hdl- cholesterol as their only lipid abnormality. In a subgroup analysis of patients in the Helsinki Heart Study with above-median HDL-cholesterol values at baseline (greater than 46.4 mg/dL), the incidence of serious coronary events was similar for gemfibrozil and placebo subgroups . The initial treatment for dyslipidemia is dietary therapy specific for the type of lipoprotein abnormality. Excess body weight and excess alcohol intake may be important factors in hypertriglyceridemia and should be managed prior to any drug therapy. Physical exercise can be an important ancillary measure, and has been associated with rises in HDL-cholesterol. Diseases contributory to hyperlipidemia such as hypothyroidism or diabetes mellitus should be looked for and adequately treated. Estrogen therapy is sometimes associated with massive rises in plasma triglycerides, especially in subjects with familial hypertriglyceridemia. In such cases, discontinuation of estrogen therapy may obviate the need for specific drug therapy of hypertriglyceridemia. The use of drugs should be considered only when reasonable attempts have been made to obtain satisfactory results with nondrug methods. If the decision is made to use drugs, the patient should be instructed that this does not reduce the importance of adhering to diet.